Fun to Teach Innovative Curriculum! Designed for elementary teachers and learners our units, games, activities and lesson plans for math, literacy, Spanish, and ESL ELD make it Fun To Teach! Simple and clear easy-to-follow instructions. Great activities for before and after school programs! 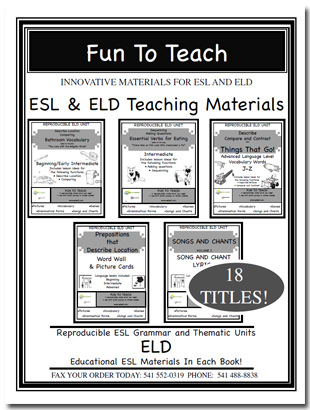 Educational ESL Materials In Each Book! Ideal materials to assist in teaching English Language Development. Explicit instruction in the rules of grammar! Fun To Teach ESL ~ ELD Grammar Units are aligned to the language strand of the common core standards. The purchasing teacher is granted limited copyright permission to photocopy the pages in this book bearing a limited copyright line. These pages may be reproduced for student, classroom, or instructional use only (not for resale). © COPYRIGHT 2009 by Lori Wolfe and Sandy Clark. Limited Reproduction Permission: Teachers are granted limited copyright permission to photocopy this page for student, classroom, or instructional use in one classroom only (not for resale). Reproduction for an entire school or school district is unlawful and strictly prohibited.